Anna Doyle Wheeler was born in Ireland. She married at the age of 15. Her husband was an abusive alcoholic. She escaped from him and fled to the island of Guernsey (Off the South East Coast of England) where she her uncle lived. She later returns to England for the benefit of her daughters' education and becomes part of intellectual circle of London. Ever resourceful she finds ways to support herself and still engage in intellectual pursuits. She is best known for her writings on the behalf of women's liberty and education. As an adult she moved between London, Dublin, Caen, and Paris bringing political and feminist ideas wherever she traveled. She can only be admired for 'taking hold of her life and her future' and doing so much to advance political causes. 1785 Anna Doyle is born in Fennor Parish, Tipperary, Ireland. Her father was a prebendary, ie, "an Anglican clergyman who received a prebend stipend or was associated with a cathedral". Source for date: Margaret McFadden Hypatia Vol. 4, No. 1, The History of Women in Philosophy (Spring, 1989), pp. 91-101. As a child she appears to have had no formal schooling but she did learn to read and write. She also learned French and some geography. Since her family often discussed politics, she also learned a good deal about that subject also. 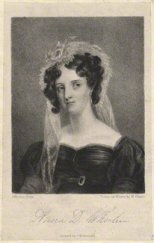 1800 At the age of 15, she married Francis Massey Wheeler, the 19 year old son of a Baron.. The newly weds lived in Limerick. During the first two years of marriage, She gave birth to two daughters but her the marriage was an unhappy one. Her husband, Francis, was an alcoholic and he was abusive. Anna took refuge in reading. She read widely in French political thinkers and she also read the works of Mary Wollstonecraft. 1812 Anna Doyle Wheeler escapes from her husband and goes to the Island of Guernsey where her uncle, Sir John Doyle, was governor. In Guernsey she is becomes part of the social scene and meets politicians from the European Continent as well as the British Isles. 1815 In this year she leaves the Island of Guernsey so her daughters can attend school in London. 1820 Francis Massey Wheeler dies. Anna is in financial difficulties. Friends and family help out. She earns some income as a translator of works from France, especially the works of the French Owenites and Charles Fourier. She also began what became a life long habit of visiting various family members and friends as a means of support because she did not have a home of her own. For the rest of her life she moved between London, Dublin, Caen, and Paris and in doing so she became a means of spreading political and feminist ideas. Anna Doyle Wheeler was often in the company of major philosophers and political thinkers of her time. For example, she knew Jeremy Bentham, James Mill, John Stuart Mill, Robert Owen, Frances Place, William Thompson and Frances Wright. 1823 She moved to France where she met Charles Fourier. She became the major translator of his works into English. 1825 William Thompson published "Appeal of One Half of the Human Race, Women, Against the Pretensions of the Other, Men"
This work was written in response of James Mill's article ON GOVERNMENT that was published in the 1819 edition of the Encyclopedia Britannica . Thompson's work contained an, 'Introductory Letter to Mrs. Wheeler' which credits her as the source of many of the ideas in the work. 1829 Anna Doyle Wheeler gives a lecture ion the "Rights of Women" in a chapel near Finsbury Square, London. 1830 She becomes associated with the Tribune des femme. the journal established by working class women in France in 1832. Originally names La Femme libre it only published articles by women and aimed for the freedom of women. 1833 William Thompson, who was a good friend, dies. 1840 She retires from active work in the feminist movement because of her poor health. She does continue corresponding with her friends, especially those in France. She was invited to participate in the revolution of 1848 - but she declined this invitation. Her health was poor. 1848 Anna Doyle Wheeler dies at the age of 63. 1825 As noted above William Thompson credited her with many of the ideas in his Appeal of One Half of the Human Race, Women, Against the Pretensions of the Other, Men. 1830 The Rights of Women published in the British Co-operator.